Finally we are moving along to Barra de Navidad and Manzanillo. Along the way plan to stop at Tennicatita perhaps the best anchorage on the Gold Coast. The last time we purchased fuel was in Dana Point CA on our way south to Ensenada. September 19th we paid $2.65/gal. Not as good as our current low cost record of $1.91 earlier last year at Gray's Harbor but better than the price in San Diego. Since Dana Point, we have run 183 engine hours and approximately 1,400 miles. The cost of diesel in Mexico still does not float with the world price so we paid $3.43/gal. Put on 231 gallons just to have plenty of reserve in case we went further south than Manzanillo. There is fuel in Barra and Manzanillo but we always try to have enough on-board to make it to the next 2 fuel stops. The extra weight helps the boat ride better and we like the option to buy fuel when we want to not need to. After fueling we moved to the anchorage at La Cruz and joined our friends Neil and Dianna aboard Salacia. 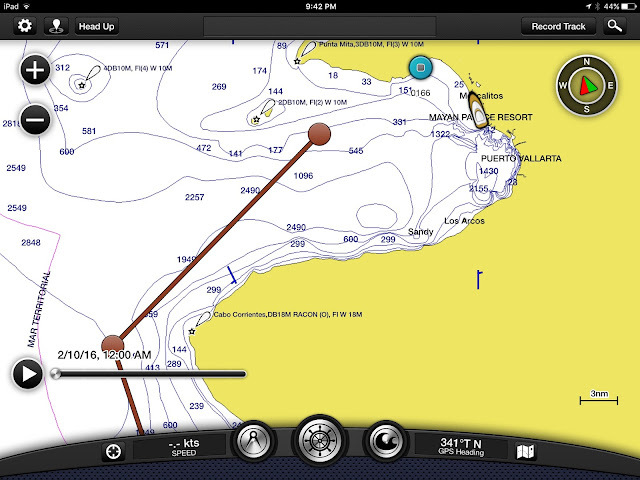 I've gotten into the habit of leaving from an anchorage whenever possible rather than from a marina. It's much faster to pick up an anchor than storing shore cords, hoses etc that are part of the marina departure. It's also easier to make a scheduled departure window from the anchorage. No last minute runs to town etc. 1/12/16 awake at 5AM and underway at 5:11am. The goal is clear Cabo Corrientes point in the early mornings to avoid building winds and seas seen in the afternoon. The point is known to be windy and choppy, much like Point Conception in California. Our anchorage was well protected and there were about a dozen other boats well spaced throughout the anchorage. The Westport set a stern anchor to avoid the swells and the crew spent over 2 hours retrieving it the next morning. Their Fortress 57 really dug in. We carry the same anchor as a backup to our main Rocna bow anchor. Late one evening 6-8 Dorado swam around the boat chasing bait fish for about 20 minutes. I hooked up on a 3' long fish using a 16# test rig I keep on the aft deck for fun. The fish jumped once and broke the line. For the next 20 minutes threw everything I had in the tackle box to no joy. Even hit a fish on the head with a spinner but he just kept swimming! Visibility was about 20 foot so got plenty of good views of Dorado in nature. Just none in the boat! Mary and Keela enjoyed the calm seas and warm waters. Next stop is Barra de Navidad and the French Baker!